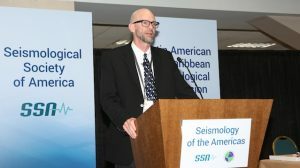 17 May 2018–SSA plans to hold its annual meeting in San Juan, Puerto Rico in 2022, the society’s new president Peter Shearer announced 14 May at the opening ceremony that welcomed participants to the Seismology of the Americas conference. 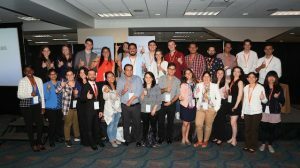 The 14-17 May gathering in Miami brought together SSA and the Latin American and Caribbean Seismological Commission (LACSC) for their first joint meeting. At the conference on 17 May, LACSC also announced the election of its new president, Mario Ruiz of the Instituto Geofisico Escuela Politecnica Nacional in Ecuador. 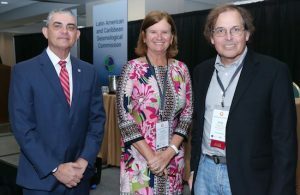 LACSC, a member commission of the International Association of Seismology and Physics of the Earth’s Interior (IASPEI), will hold its next meeting in 2020 in Quito, Ecuador. Huérfano also asked for a standing moment of silence as the names of the victims of the 1918 San Fermín earthquake, also known as the 1918 Puerto Rico earthquake, scrolled across a screen at the front of the meeting hall. This year marks the 100th anniversary of the destructive magnitude 7.3 earthquake and tsunami event, one of the most severe earthquakes in Puerto Rico’s history. In a second presentation, meeting co-chair Elizabeth Vanacore of the University of Puerto Rico at Mayagüez discussed how the people behind the Puerto Rico Seismic Network managed to bring their work and their lives back online after Maria’s landfall. The harrowing hours and weeks after the hurricane forced the PRSN team to come up with creative solutions to a cascade of communication and equipment problems—filling a cistern with water from a UPRM swimming pool, among other “hacks”—even as many of the employees could not reach friends and family for weeks. At the SSA Public Policy Luncheon Talk on 16 May, Alejandro de la Campa, director of the Caribbean Area Division of the Federal Emergency Management Agency (FEMA), discussed his agency’s ongoing response to Maria in Puerto Rico, and how the agency is preparing the island for hurricane season, which is expected to begin in early June. Alejandro de la Campa, Christa von Hillebrandt-Andrade and past SSA President Andy Michael. Despite decades of coordinating emergency responses during natural disasters and in war zones, de la Campa said he “had never seen anything like” the destruction wrought by Maria. He called himself both “a survivor and a responder” to the hurricane, recalling that he went four days after the storm struck before seeing his wife and daughter. Relief and mitigation efforts by FEMA in Puerto Rico follow an “all hazards” model, he said, making them suitable for earthquake and tsunami events as well as hurricanes and tropical storms. FEMA’s efforts to build sturdy homes and transportation systems on the island, implemented after 1998’s Hurricane Georges, proved successful against Maria, he said, suggesting that similar mitigation efforts and funding will be important to Puerto Rico’s future. Read more stories from the Annual Meeting on our News page.